Pushing by hand is not always the most effective, efficient, or controlled way to make a cut, especially on large projects or in dense hardwoods. Some times it takes extra power or persuasion, and that's where Flexcut's mallet tools come in. 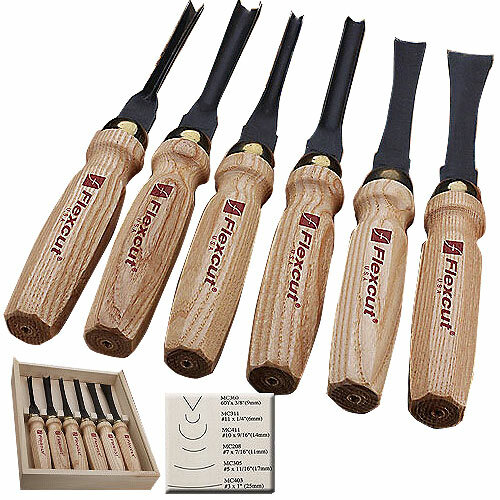 This six piece set has a good sampling of tools to get started on simpler projects and will suit the needs of most beginning carvers. Set Includes: #3 x 1" Sweep (MC403); #5 x 11/16" Sweep (MC305); #7 x 7/16" Sweep (MC208); #11 x 1/4" Sweep (MC311); #10 x 9/16" Sweep (MC411); 60 Deg. x 3/8" V-Part (MC360); and wooden storage case.